* Your photos and videos are transferred directly from device to device using your local wifi network. They are not stored in an external server and they never leave your local wifi network. As you can see from the Requirements list above, all your PCs / devices that you want to transfer photos between need to be on the same WiFi network. 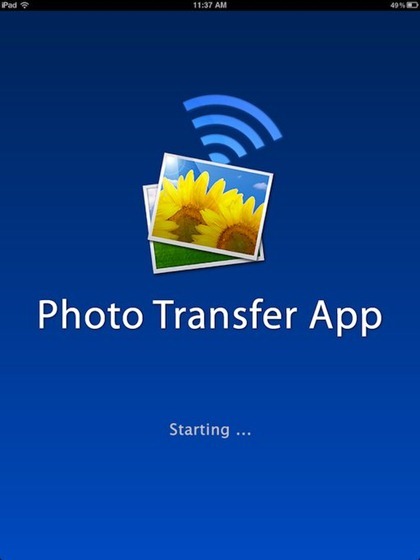 Photo Transfer App has a basic and easy to use interface. At the top left of its main screen there are buttons to choose Receive or Send mode. Along the bottom nav bar the first two items are PC and Device. So, for instance, when you first open the app you will be in Receive mode and on the PC tab. So the screen will show you the URL you need to enter to move photos from your PC over to the iPad (or iPhone or iPod Touch if you run the app on those devices). You just enter that address in your web browser on your PC and select photos to upload. As soon as you do, the iPad will start receiving them and saving them to your Saved Photos album. If you want to receive photos from an iPhone or iPod Touch, you first choose which photos or videos you want to send on the sending device – for example, your iPhone. Then on the iPad (the receiving device in this case) just tap on the Device tab on the bottom nav bar, select the sending iPhone as the device, and then tap on Get Photos or Get Videos. As soon as you do, the transfer will begin and you get a very nice status bar that continually updates the progress of the transfer. To send photos to a PC you just change to send mode, select photos or videos you want to transfer, and the screen will show you the URL to enter on your PC. Once you do, you’ll get a page showing you the photo names and offering a link to download them in a .zip file. An important thing to note here is that you’ll do all of this far faster than my descriptions here are making it sound. I’ll try to get a quick video demo done soon, because the UI for the app is very simple and easy to work with. When you’re sending from device to device, you can’t close out of the app at either end while a transfer is being done. If you do, it’ll bomb out and you’ll need to start it again. The app is quick and easy to use. The interface is basic so it’s very easy to see how to transfers in all directions. It’s a rock solid app. I’ve been using it for a long while now, and it has never crashed on me or failed to complete a transfer. I’ve used the excellent Pastebot app for clipboard sharing between Mac and iOS devices, but it’s one big drawback is that while it offers support for multiple iOS devices, it constantly forgets one or other of mine in day-to-day use. As in, wheh sync is working with the iPad it will fail on the iPhone, and vice-versa. Photo Transfer app does not have this issue at all. Transfer works every time, between my MacBook and all devices, and in all directions. — 56 photos sent in 3 minutes. Selecting photos and videos is a little awkward – especially if they are ones that are not very recent, because the app breaks up albums into sections with 56 images in each. So you can’t just browse through a whole album at a time. It means you have to look through things in the Photos app and then try to guess whereabouts in the blocks of 56 your desired images are. I don’t know if this due to some Apple-imposed limitation (I imagine so) but it needs improvement. Also, the Camera Roll (on the iPhone) and Saved Photos (on iPad) albums are placed at the very bottom of the list of albums. I would much prefer to see them at or near the top. As mentioned above, this has become a big favorite app of mine. Although I still use Pastebot for general clipboard sharing, I now use Photo Transfer App as my first choice for moving photos around between my iPhone, iPad, and MacBook. 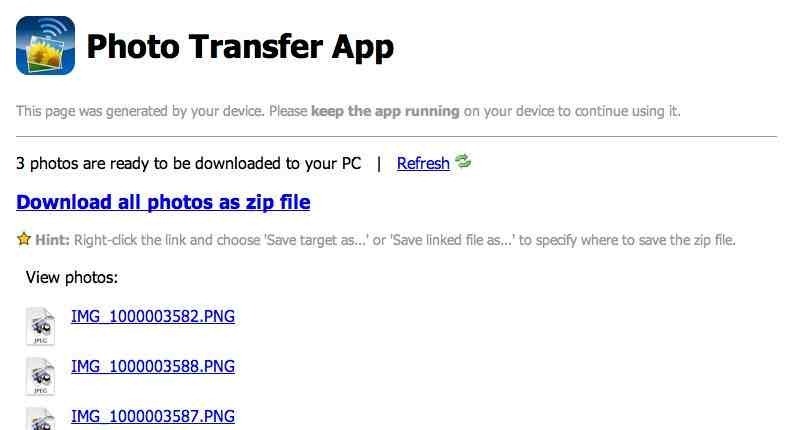 If you’re looking for a good way to transfer photos between your iPad, iOS devices, and PCs then you should definitely give this app a look. It’s on sale for (what’s left of) this weekend at $1.99 (normally $2.99). You can find Photo Transfer App in the App Store now. It’s a universal app, so you’ll just pay once to install it on all your iDevices. Or you could just get a Windows Phone 7, which does all of this automatically by uploading photos to your skydrive. Sound like a handy and easy to use App. It’s very nice that it is universal I’m going to give it a go. Cool – let us know what you think of it. Cool – – give us your thoughts when you’ve had a chance to use it a bit. Ha – yeah, wouldn’t that be sweet. If I could find a way to never open iPhoto again that would be all sorts of wonderful. Just got an iPad 2 w 32 gig. New to the whole thing, but am trying to figure out what Apple wants us to use to build photo albums on Costco or Shutterfly, etc. Nothing is working now…suggestions or thoughts? Is there an app nor this one I can use to upload my photos to build albums? Thanks in advance. — Sync your photos via iTunes to an app like iPhoto on the Mac or a Windows equivalent that lets you create albums. — Use a 3rd party app on the iPad that lets you create albums on the iPad itself. 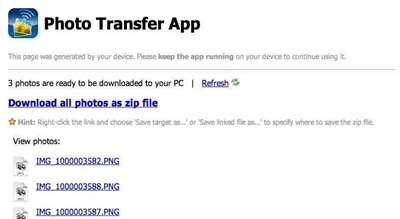 — Use an online file sync service like Dropbox or similar to upload photos and put them into albums / folders. Thanks I will see what I can do and will keep you posted. So I followed your suggestions. I did a lot of research before I found something called CloudAlbums. That app directs one to create a Dropbox account which I did. I then made a few test albums. I then synced everything through ITunes. From there I was able to upload pics to make prints and albums. Not as exactly as easy as I would have liked, but I’m sure I will become more adept. Thanks for the help. And for the record, PhotoPad is a very easy to use photo editor for the iPad. Glad you’ve got a system going. There are a lot of superb apps for image editing and effects for the iPad. A few that I would very highly recommend: FX Photo Studio HD, Photo Toaster, 100 Cameras in 1 for iPad. It’s great when it works, but I haven’t been able to access the web site for weeks now. Yes, I’m using the same Wi-Fi and typing in the IP address exactly and I’ve reset the router. Page not found. Bummer! There’s no data limit or charges for using Bluetooth. You should be able to get wireless to work though, and that will be much faster. When you transfer from iPad to PC, do you lose everything on the iPad, or do the pictures still stay there?